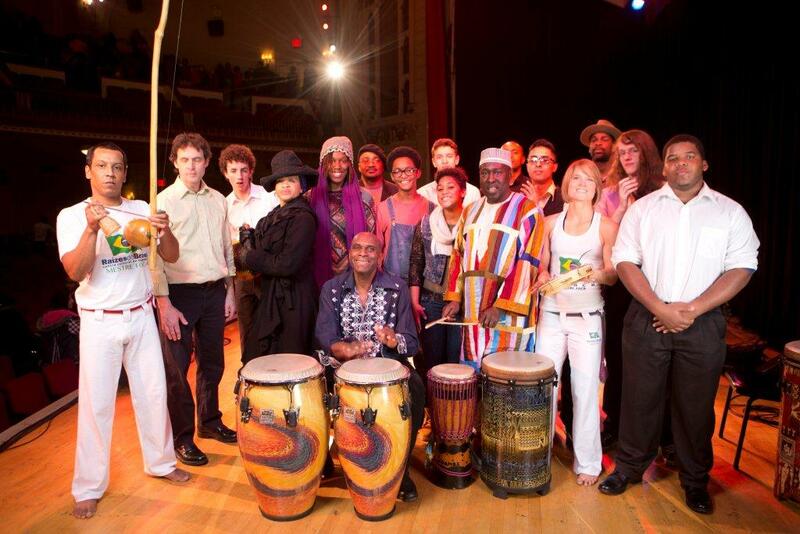 Haynes, (seated center) along with other musical guests, was joined by his drumming students from the Newburgh Free Academy (NFA) at the historic theater on Broadway. The NFA students, from upstate New York, wowed the audiences with their synchronized drumming skills. The Town Hall (123 W. 43rd St.) and Con Edison recently presented their annual Black History Month celebration for public school children with free performances by percussionist and Grammy® winner Jeff Haynes. Sponsored by Con Edison, the shows were presented to children in grades 3-8 from participating New York City schools as part of their school curriculum to introduce students to the arts. Jeff Haynes is a master of African, Caribbean and Brazilian-rooted percussive instruments. He was joined by student drummers, a spoken word artist, dancers and other musicians. Haynes has toured worldwide with his rhythmic, multi-instrument percussion collection, and has musically accompanied a “Who’s Who” of artists on more than 100 recordings from jazz greats Al Jarreau, Cassandra Wilson, and The Pat Metheny Group, to Chaka Khan, Harry Belafonte, Peabo Bryson and Celine Dion. It is estimated that over 4,500 students attend the Con Edison Town Hall Black History Month celebration at The Town Hall each year and for most students, the event is their first major theatrical experience. “We are so thrilled to continue our partnership with Con Edison and offer NYC public school students the chance to experience the arts firsthand,” says Town Hall President Tom Wirtshafter. In 2010, Haynes received a Grammy® Award in the Best Musical Album for Children category for his collaboration with legendary folk storyteller Pete Seeger on “Tomorrow’s Children.” This year Haynes is nominated for another Grammy® as producer of “Pete Seeger: The Storm King,” a four-disc collection of spoken-word recordings performed by Seeger and more than 50 musicians. Haynes is also the creator of D.R.U.M. (Discipline, Respect, Unity and Music), a drum and spoken word workshops that’s presented in schools and cultural institutions throughout New York State. The youth-enrichment program supports team building and children at risk. The free presentations are offered to invited New York City students from participating schools only. Con Edison is a subsidiary of Consolidated Edison, Inc. (NYSE: ED), one of the nation’s largest investor-owned energy companies, with approximately $12 billion in annual revenues and $42 billion in assets. The utility provides electric, gas and steam service to more than three million customers in New York City and Westchester County, New York. For additional financial, operations and customer service information, visit Con Edison’s web site at www.coned.com. The Town Hall is among New York City’s most historic venues. Built in 1921 by a group of suffragettes, The Town Hall began as a lecture hall and public debate forum and grew to be a national landmark institution for arts, culture and education. Over the decades, Eleanor Roosevelt, Margaret Sanger, Billie Holiday, Igor Stravinsky, Marian Anderson, Bob Dylan and Miles Davis have graced the stage. It was home to the legendary radio program, America’s Town Meeting of the Air, dozens of historic albums and recordings, and American debuts of musical legends. Today, the Hall boasts the very best in music performances, spoken word, comedy and dance, including speaking engagements with presidents and senators, live broadcasts of Garrison Keillor’s Prairie Home Companion, and a number of new and critically acclaimed music series. www.the-townhall-nyc.org.